Lentils are very rich in numerous vitamins, minerals and antioxidants. 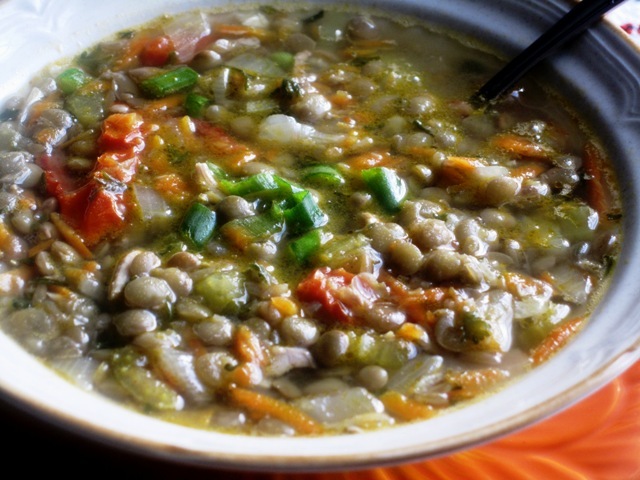 Hearty Lentil soup is a perfect comfort food anytime, but it sure hits the spot on cold days. They also mention that those who suffer from gout or kidney problems, should limit, or avoid lentils. This recipe yields 8-10 servings. Heat oil,or butter, in a large saucepan, and saute onions until translucent. Add celery and carrots, and saute until wilted, then add garlic, and saute another minute. Use a 6 quart stock pot to heat up the broth. Add the sauteed vegetables, bay leaf, Sun-Dried tomatoes, Paprika, Oregano, Cumin, Thyme, salt and pepper to taste. Bring to boil, add lentils, and simmer until lentils are cooked, about 30 minutes. Add wine, and simmer couple of minutes. Add chopped parsley, and serve.